Project OJIBWA - The story of how HMCS OJIBWA came to Port Burwell is spectacular because of the size of the prize, the mountains of red tape, tons of dredged materials, and the vagaries of Mother Nature that threw challenges at our team. The story's success is a credit to the skill of the museum engineering team who never gave up, the steadfast volunteers, and most of all because a small museum in an inland community in Southwestern Ontario identified a need tell the story of the Royal Canadian Navy in a part of the country 1,200 nautical miles from the sea. The thousands of people who turned out in all kinds of weather, all day and through the night to see HMCS OJIBWA make her way from Halifax to Port Burwell proved us right. Welcome to ME. 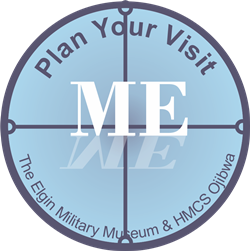 Museums Elgin is the combined term for the Elgin Military Museum in St. Thomas, Ontario and its 'SUB' station HMCS Ojibwa our Cold War Oberon Class Submarine located in nearby Port Burwell on the north shore of Lake Erie. HMCS Ojibwa is the largest artifact in the Museum of Naval History which will be built alongside the submarine.